A bedroll can be made from blankets. Plastic juice and soda bottles can be used for storing water or food. For warmth, you can wear layers of the clothes you already own. Any bleach that does not have additives can be used to disinfect water. Dental floss can be used as a string or fishing line. Any paper can be used as fire starters. Newspaper, mail, phone books, old school papers, etc. Super glue can be used for repairs and gluing small cuts. Baseball bats and other sports implements can make excellent weapons. A baseball or bicycle helmet can protect your head in an earthquake, tornado, or a riot. The alternator from your vehicle can be modified to make a small generator to charge batteries. If you have a home first aid kit, this can be used for treating injuries. In a power outage, all the food you have in your house can be consumed, starting with the foods that will spoil first. This will give you at least a few days of survival before you have to begin eating from your food storage. Nails – you can nail any unnecessary doors and window shut to increase your security. Nail wood over windows for protection against storms and intruders. You may have to do a bit of research on how to use some of these items, but most are just common sense. 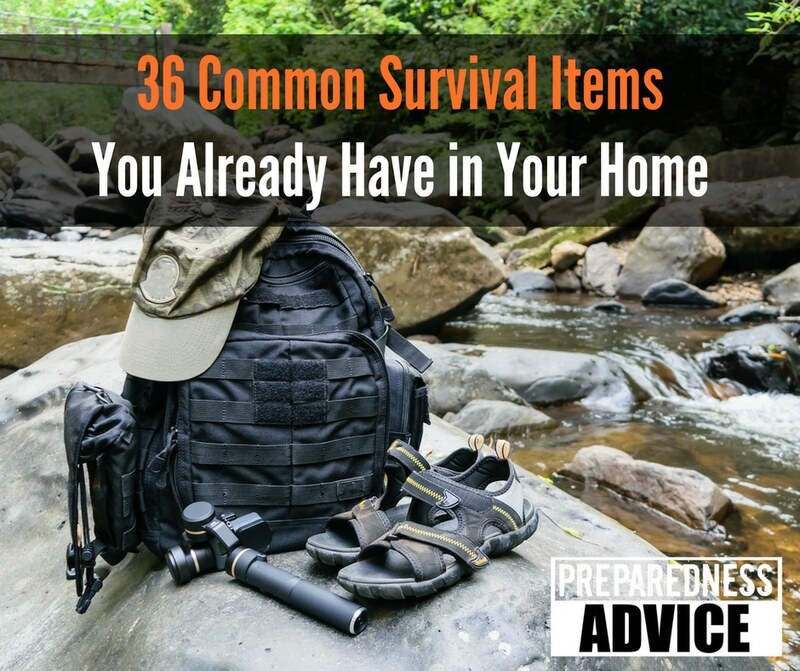 These are just a few of the items that occurred to me, I am sure that many of you have more and better ideas for using common household survival items. Don’t be afraid to share them with us in the comments section. If all you do is begin to set aside these items in emergency kits or, at least, know how you can use them in an emergency, that’s a good start. This entry was posted in Self sufficiency, Seventy-two hour kits, survival and tagged Common Household Survival Items. Bookmark the permalink. A small hard side kiddie pool can be a start to building an outdoor shower or a decontamination station. Newspaper ran through the shredder makes the best fire starter we have used. Thanks for the article, there were several items contained therein that we had not thought of. You can also use your shredded newspaper (no glossy pages) for mulch in your garden. It keeps most of the weeds out and if your paper is mostly white then it will reflect sunlight to the under side of the foliage. An added bonus of using it as mulch is using much less water and of course ITS FREE!!! 6 sheets of newspaper will stop all small seeds from poking through. the ink was soy based ink. put shredded paper on top . if a plant does poke through, put more pages on top or pull the plant. Always have a big bottle of vodka. Antiseptic and can spray clothing to remove smells. Can distill herbs into tinctures. Love cutco scissors\ knives. Cuts through frozen food as well as plant material. Sharpies. Storage bags for everything. Vinegar will kill bacteria that alcohol won’t. Also, colloidal silver. I couldn’t agree more in this post!